Adjustable for angle from strongside to crossdraw, the ambidextrousParagon™ IWB is optimized for the popular appendix mode of carry. 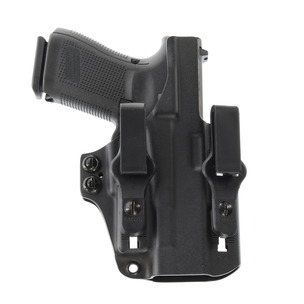 With a Kydex® holster body, the Paragon offers comfortable carry, fast draw and easy return to holster. Dual tuckable belt clips ride in slots fore and aft of the gun body, allowing adjustment for ride height and carry angle. Twin tension units allow easy adjustment of the draw stroke. 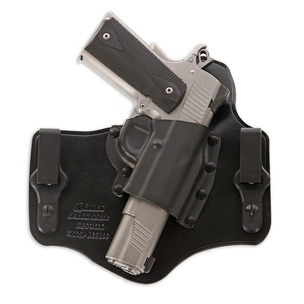 Raised sweat guards on both sides of the handgun protect the wear’s body from the gun and promote a smooth and safe return to holster. Included with the Paragon is an optional claw-type stabilizing wing for those gun carriers who prefer it. Available in black, the Paragon retails for $79. An alternative to Galco’s best-selling KingTuk Deluxe IWB, the new KingTuk™ Classic provides comfortable carry, fast draw and easy return to holster. Accessories for the KingTuk Deluxe, such as the optional metal belt clips and tuckable belt loops, all work perfectly with the KingTuk Classic. Fits include most popular pistols like 1911s, Glock, HK, Ruger, SIG, S&W, and Springfield. Available in black, the KingTuk Classic retails for $79. An update of the traditional Ranger-style belt, the EDC Belt features adjustable billet straps and a quick-release “cobra” style buckle. Constructed of Type 13 nylon webbing, the EDC (Every Day Carry) Belt features dual hook-and-loop billet straps on either side of the cobra buckle, giving wide latitude for adjustment to accommodate waist variations or handguns carried inside the waistband. Rigid and extremely stable, the EDC Belt is an excellent choice for both training and everyday wear with even the heaviest of handguns and accessories. 1½” wide and available in black, with four sizes to fit most shooters, the EDC Belt retails for $80. 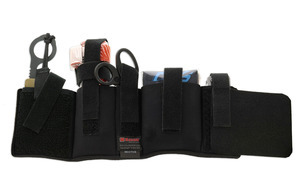 ATM-KIT™ (Ankle Trauma Medical Kit) carrier is designed for convenient everyday carry of medical tools and supplies for first responders, gun carriers, or anyone who wishes to be prepared in an increasingly dangerous world. The ATM-KIT fits ankle/boot circumferences up to 16″. For those who wear boots or have larger legs, a Boot Extender is available which increases circumference up to 5″. The ATM-KIT does not include tools or supplies (shown for illustration purposes), only the pocketed ankle cuff and retention straps. Emergency rescue tools and first aid supplies are sold separately by other sources. The ATM-KIT is ambidextrous and available in black with an MSRP of $70. This entry was posted in Holsters and tagged ATM-KIT, Galco, KingTuk, Paragon. Bookmark the permalink.